If you came to this page directly, you might wish to read a page with an introduction to this section or a page covering the Walls of Acre first. Acre is mentioned in ancient Egyptian and Syrian chronicles. In the IIIrd century BC it was renamed Ptolemais after the name of the Greek dynasty ruling Egypt, but of the ancient Ptolemais there are now no remains noted William Turner in 1817 in his Journal of a Tour in the Levant. 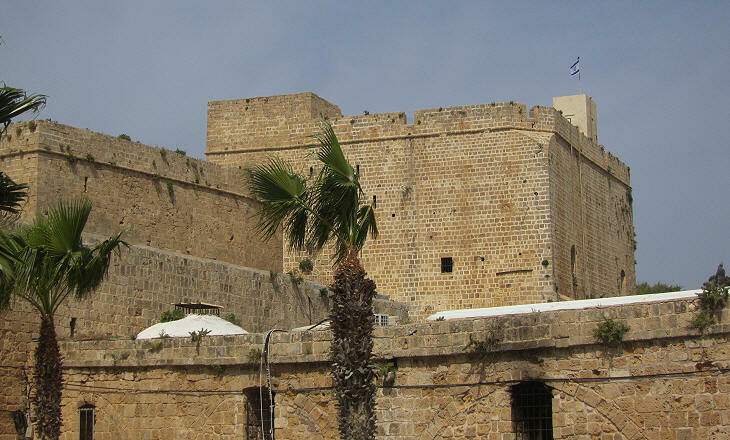 Acre is mainly known for its role during the Crusader period. The town was conquered by Baldwin, King of Jerusalem, in 1104, five years after the establishment of that kingdom. Baldwin was helped in his enterprise by fleets from Genoa and Pisa and thanks to merchants from these towns Acre became a key trading port in the Levant. In 1110 the Knights of St. John, a military order originated from a brotherhood founded at Jerusalem by Amalfi merchants and named after St. John the Baptist, opened their first hostel/hospital at Acre. 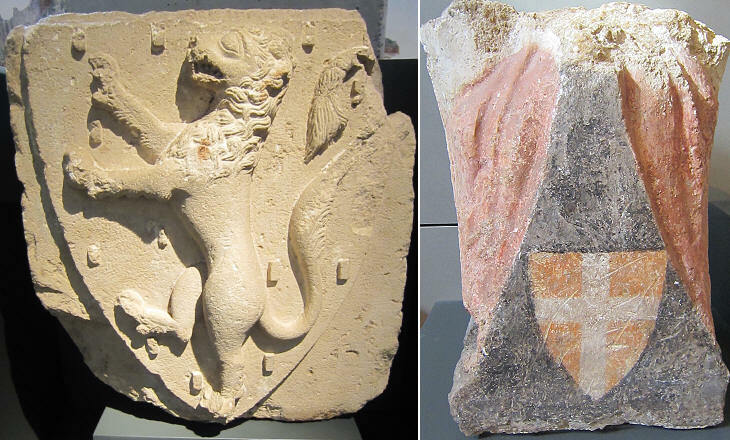 Because of their activity in favour of the pilgrims, the Knights of St. John were also known as the Hospitallers. The military aspect of the order acquired a major importance towards the end of the XIIth century, when the Muslim threat on the Crusader States increased. They were entrusted with the defence of key fortresses such as Krak des Chevaliers and Marqab in Syria. 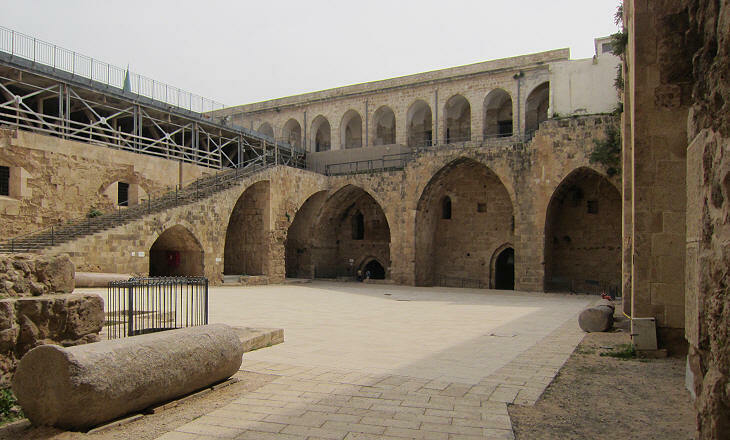 Today's citadel is mainly the result of Ottoman additions and changes made during the British Mandate of Palestine, but some underground halls belong to the Crusader fortress. 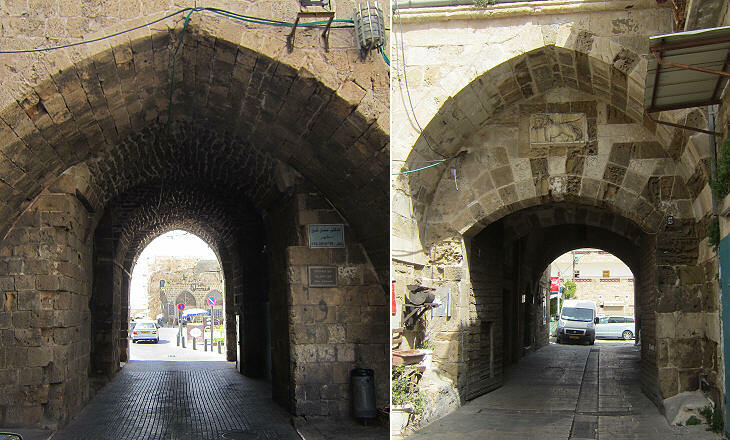 Acre was seized by Saladin in 1187, but King Richard I the Lionheart re-conquered it in 1191 during the Third Crusade. German Emperor Frederick II landed at Acre to lead the Sixth Crusade in 1228 and French King Louis IX, after his failed attempt to conquer Egypt, reached Acre in 1250 where he promoted the strengthening of its fortifications (Seventh Crusade). In 1192 Acre became the capital of the remaining part of the Kingdom of Jerusalem, which from a financial viewpoint was largely in the hands of Pisa, Genoa and Venice. Wars among these cities had consequences at Acre and in 1254-67 a series of conflicts between Venetians and Pisans on one side and Genoese on the other led to the destruction of the Genoese quarter. In 1258 the Venetians relocated two decorated Byzantine pillars from a church of Acre to St. Mark's Square. Nicolò Polo, a Venetian merchant and the father of Marco, the author of a well known book of travel accounts in the Far East, resided at Acre for two years at the end of a journey during which he visited Bukhara and today's Beijing. Conflicts between Genoese and Venetian merchants lasted until the very final days of Christian Acre which was conquered by the Mamelukes in May 1291. The Hospitallers escaped to Cyprus, but a few years later they conquered Rhodes, which they lost in 1522. 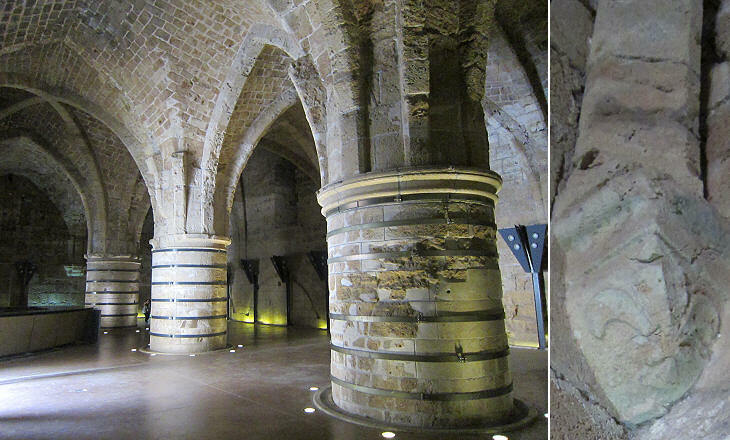 In 1530 they were granted possession of Malta by German Emperor Charles V.
Some works of the Knights of St. John yet remain and to them may be attributed numbers of massy arches supporting arches under which run streets. W. Turner. The buildings and streets of today's Acre lie above those of the medieval town. 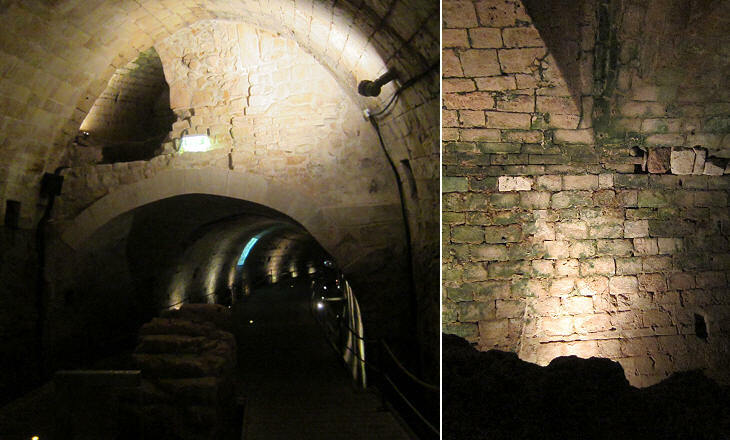 A passageway built by the Knights Templars, another military order, between their headquarters in Acre and the harbour provides an opportunity to see the underground town. 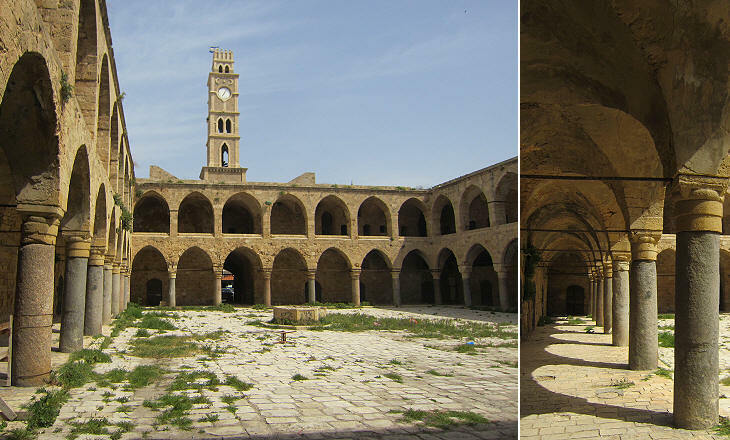 Khan el-Umdan was built in 1785 on the site of a Dominican monastery. It is unlikely Turner lived here, because otherwise he would have mentioned the granite columns of its courtyard which came from Caesarea, an ancient Roman town. At the beginning of the XXth century Ottoman Sultan Abdul Hamid II decided to celebrate his accession to the throne by erecting a series of clock towers (at Constantinople near Dolmabahce Sarayi, his residence on the Bosporus). Some of these clock towers were eventually pulled down including that in Jerusalem, but at Acre and Jaffa they are still a landmark. The image used as background for this page shows a relief celebrating the construction of the clock tower. 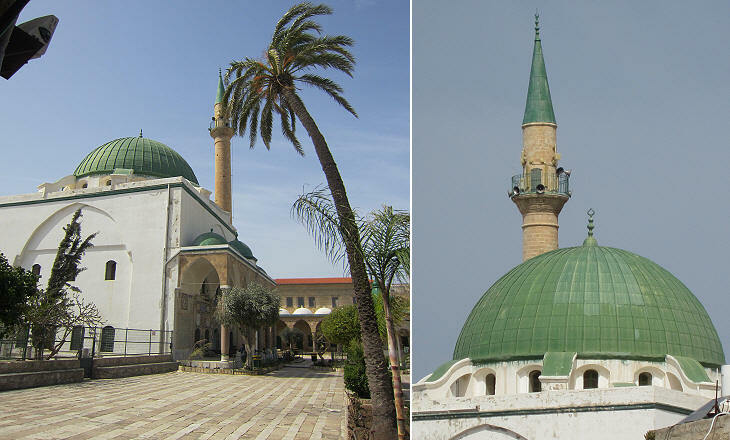 Acre has retained a distinct Ottoman character thanks to the mosque built by Ahmed al-Jazzar, governor of Acre at the end of the XVIIIth century. 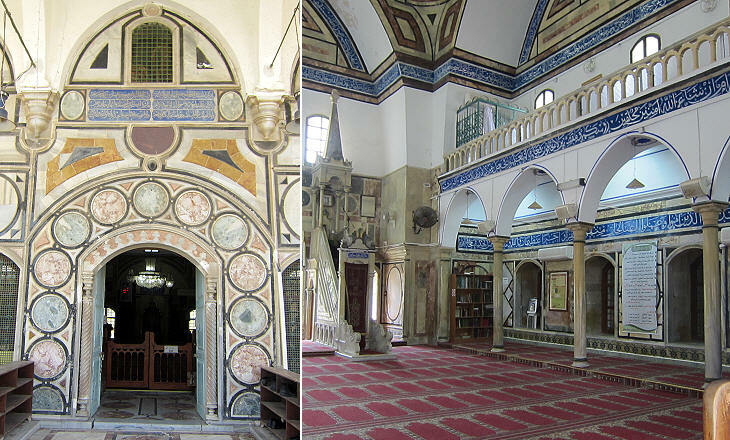 He most likely had his mosque designed by an architect familiar with the monuments of Constantinople. Al-Jazzar amassed a fortune by levying duties on all possible activities and with it he financed the construction of the mosque and of his nearby palace. 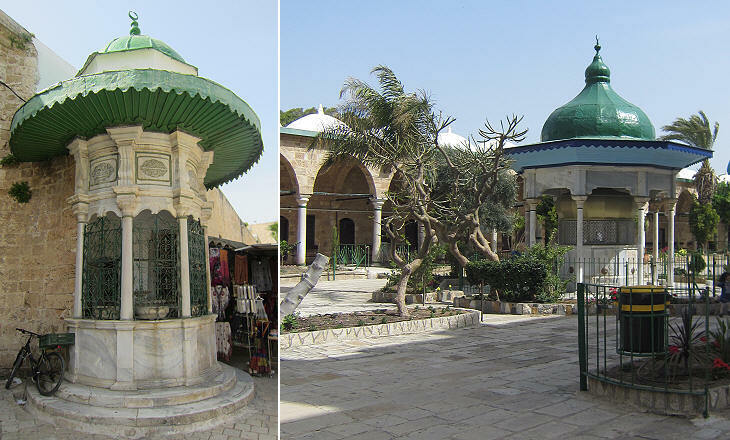 The Ottoman character of the mosque was completed by the construction of a "sebil" a kiosk where passers-by could drink. It is very similar to that near Sah Sultan Turbesi at Eyup which was built at approximately the same time. 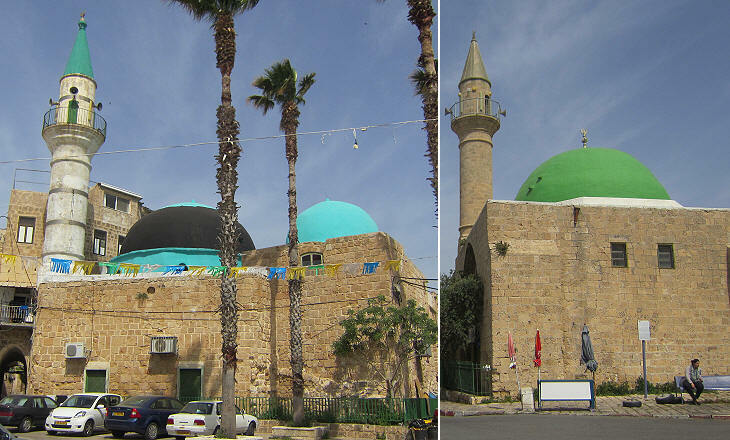 The old town of Acre is mainly inhabited by Arab citizens of Israel and most of its historical mosques are open. Return to page one or follow Turner in an excursion to Kaifah.